Here's another freebie from ARTSCOW.com : FREE! 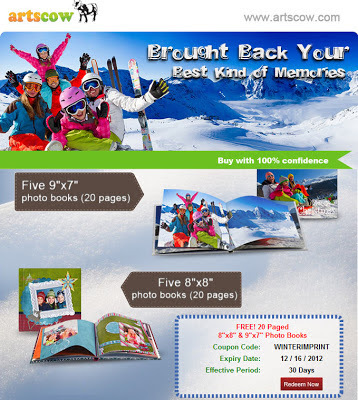 10 pcs 20 Paged 8"x8" & 9"x7" Photo Books. All you need to pay is the shipping. Yey. I need to start making layouts of my photobooks once again to avail of this promo. My Project 366 for this year was put aside when I became too busy blogging and I hope I can finish that early of 2013. After validating at your account you have 30 days to use the code. So if you validate the code to your account today Dec. 11, 2012, you can use the code up until Jan. 11, 2012 (HK time).